International Financial Statement Analysis provides the most up-to-date detail for the successful assessment of company performance and financial positions. This rich, clear reference covers all aspects from financial reporting mechanics and standards to understanding income and balance sheets. Comprehensive guidance toward effective analysis techniques helps readers make real-world use of the knowledge presented, with this new third edition containing the most current standards and methods for the post-crisis world. Coverage includes the complete statement analysis process, plus information on income tax accounting, employee compensation, and the impact of foreign exchange rates on the statements of multinational corporations. International Financial Statement Analysis provides the latest rules and best practices, with clarity and expert advice. International Financial Statement Analysis Workbook helps busy professionals understand and apply the concepts and methodologies essential to accurate financial analysis. A companion to the IFSA text, this workbook offers learning objectives, chapter summaries, and practice problems that reinforce the practitioner-oriented material to give readers the confidence they need before applying these concepts to real cases. Readers will test their understanding of the standards and mechanics of financial reporting, and make use of the tools and techniques described in the text. This informative study guide is designed to facilitate information retention, helping readers build a strong foundation in financial statement analysis, with practical applications across borders. The volatile global economy makes accurate international financial statement analysis a valuable skill, where insufficient mastery makes precise valuation impossible. 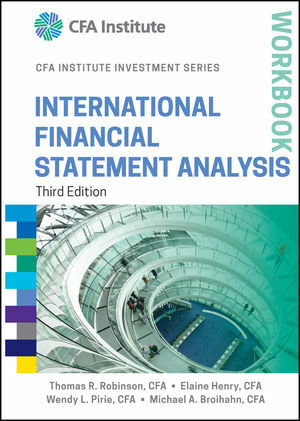 International Financial Statement Analysis provides the most up-to-date knowledge, and this workbook offers readers a chance to practice applying that knowledge with carefully constructed problems. It's impossible to tell how well a subject is mastered without applying the relevant concepts to a real-life situation. Valuation depends upon an accurate financial analysis, and practitioners need a solid grasp of the standards, formats, and documentation they may encounter on the international level. Practice makes perfect, and International Financial Statement Analysis Workbook provides plenty of practice and essential tools for understanding. WENDY L. PIRIE, PHD, CFA, is Director, Curriculum Projects, in the Education Division at CFA Institute and served as editor for this book.